It is difficult to understand why anyone opposed to the sell-out of Irish Republicanism by the leadership of Provisional Sinn Fein/PIRA could ever continence being associated with organisations such as ‘Republican Network for Unity’ which includes many of those who played their part in the sell-out of militant Irish republicanism. Still, it is perhaps better late than never that militant Republicanism has found its own voice in the creation of Saoradh whose membership can focus on purging the contempt shown by Provisional Sinn Fein/PIRA for the blood sacrifice of true Irish Republicans. The leadership of Provisional Sinn Fein/PIRA are nothing more than proxies for their British paymasters, they are traitors who can expect to find nothing at the end of their treacherous British lead/funded careers than a lonely pitiful death as now being experienced by MI6 Agent Martin McGuinness. Saoradh is opposed to the power-sharing government (although power-sharing suggests that there is some equilibrium between unionism and constitutional nationalism, while this is clearly not the case as the British remain fully and comprehensively in control of a British driven agenda) and will hold demonstrations to support republican prisoners. 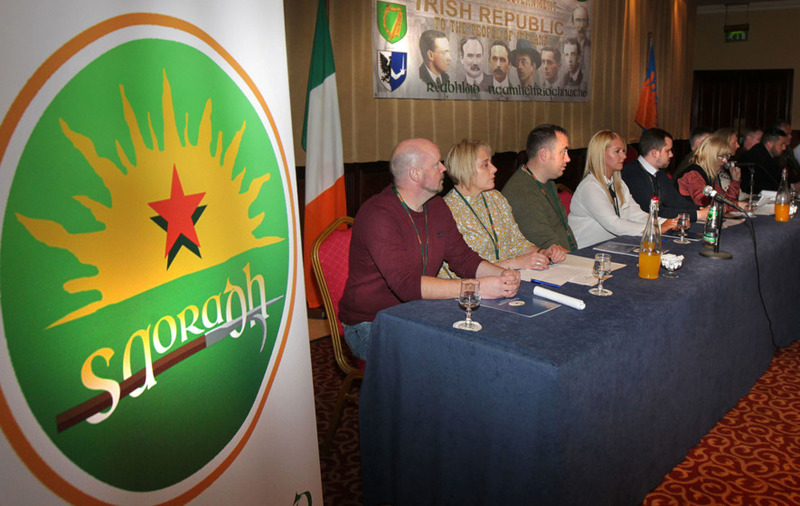 Irish republicans opposed to Sinn Fein treachery have launched a new political party called Saoradh. 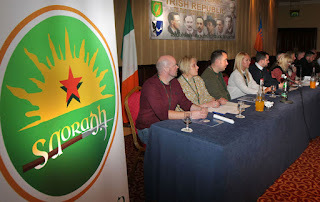 A range of high profile Republicans from across Ireland gathered at a hotel in Newry in September 2016 to outline their vision for Saoradh, the Irish word for Liberation. The radical new party, which is opposed to the power-sharing government in the North, will stage demonstrations in support of republican prisoners. Its constitution says it might, at some point, contest elections. However, if candidates are put forward at future elections to the British Assembly, the Dáil or Westminster it would be on an abstentionist basis, meaning seats would not be taken if they were successful. At Saoradh’s first Ard Fheis in September 2016 newly elected chairman David Jordan was highly critical of Provisional Sinn Féin. In remarks aimed at the party he referred to its politicians as “false prophets who have been defeated and consumed by the very system they claim to oppose”. A National Executive was also elected and motions passed by Saoradh representatives who have formed a revolutionary party to represent the working class and further the cause for an Irish socialist republic. The party has the support of prisoners from the IRA in Maghaberry and Portlaoise jails and calls were made for the release of all political prisoners. 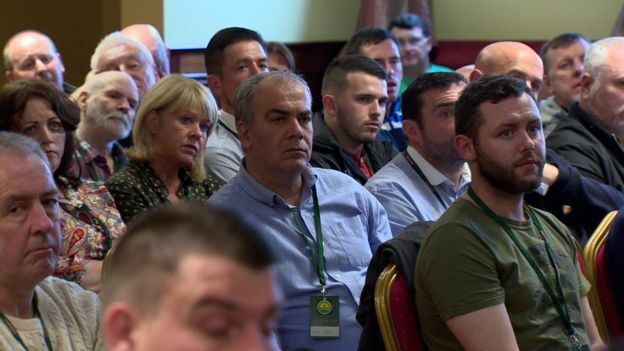 A statement from Saoradh said a “significant collective of Irish Republican activists”, who have acted autonomously in the past, had reached agreement to launch the party. 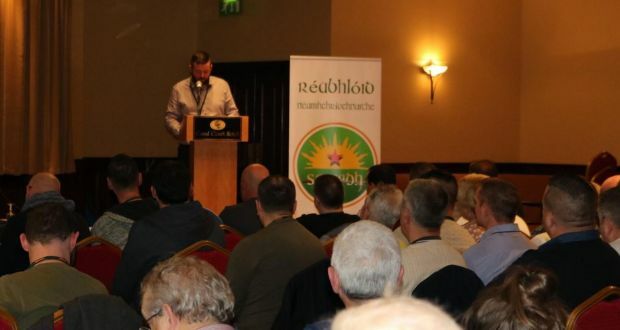 “Saoradh believes that Ireland should be governed by the Irish People with the wealth and wealth producing mechanisms in the ownership of the Irish people,” the statement said. The party believes any assembly claiming to speak for the Irish people “without being elected by the united people of the Irish nation to be illegal”. “Saoradh will seek to organise and work with the Irish people rather than be consumed and usurped by the structures of Ireland’s enemies,” the statement continued. Among those in the audience in Newry, who also heard from speakers from the Free Tony Taylor campaign and the Craigavon Two campaign, was Irish republican Colin Duffy. The chairman of a new republican political party has described it as an “unashamed revolutionary party”. Saoradh, which means 'Liberation' in Irish, held its first ard fheis in Co Down in September 2016. Republicans from across Ireland attended the event, during which Co Tyrone ex-prisoner David Jordan was selected as the party’s first chairman. Other high-profile republicans at the launch at the Canal Court Hotel in Newry included Colin Duffy and his brother Paul, Dee Fennell and Nuala Perry. Jordan, who is currently on bail after being charged with trying to kill a PSNI officer in a bomb attack in Castlederg in 2008, said the new party will be rooted in socialist politics and be controlled from the “ground up”. During the event Derry republican Thomas Ashe Mellon read out a message of support from prisoners aligned to the ‘IRA’ in Maghaberry and Portlaoise prisons, saying they rejected "sectarianism and sexism which have been prevalent in the past". A message was also read out from veteran Belfast republican Billy McKee, a founding member of the Provisional IRA. In an address to members, the new chairman said the leadership will be regularly rotated. “I have no desire to sit as your chair for longer than is necessary. The Irish habit of following the personality rather than principles has been disastrous in the past for political movements and I am sure that as a collective we can rise above that." And in another thinly-veiled criticism of Provisional Sinn Fein, he was critical of those who participate in the current political institutions. “Those who sit in the pay of our nation's oppressor while claiming to champion our liberation are false prophets who have been defeated and consumed by the very system they claim to oppose," he said. "These institutions are the harness for the horse; they are designed to prevent the Irish people regaining their national sovereignty." He claimed history was "littered with the failures of successive ventures into constitutional nationalism". The new party was said to represent the “birth of a radical, revolutionary, republican party that will increase the relevance of our ideology across society and show our enemies that we can match our faith with forceful articulation, growth, participation and, most importantly of all, genuine activism”. Speaking after the conference, Jordan said Saoradh is a “stand alone” party with no links to other political groups or organisations. He said talks aimed at forming it have been taking place for several years and involved a range of organisations, with branches have already been set up the length and breadth of Ireland.